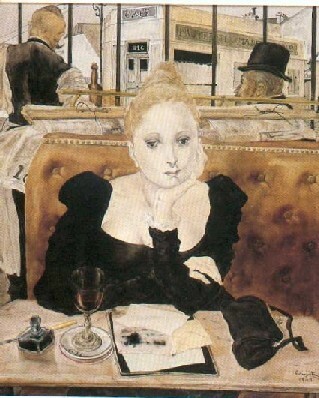 Foujita was born in 1886 in Japan and went to Paris to study painting when he was 26. He became close friends with artists such as Modigliani, Soutine, Picasso, Matisse, who are now very famous. Lots of models visited him since he had a hot bath tub in his apartment and they modeled for him in return. One of them was Kiki. He painted her in “Nu couché à la toile de Jouy” and it made him famous. 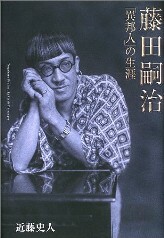 He became so famous that every Japanese people in Paris at that time were asked if they knew Foujita. In 1939, he went back to Japan and asked by the government to do war paintings which “give courage to Japanese soldiers”. He devoted himself for this task but by the time the WWII finished, he was blamed that he was a war criminal. Although no artists were in 1070 war criminals at the end, Foujita was hurt and felt betrayed. He really loved Japan but he went back to France and took French nationality and became Catholic. Leonard is his Catholic name, taken from Leonard De Vinci. His last work is to build and paint a chapel in a town called Reims in France. He passed away three months after the completion of the last work and he was buried at the chapel. I learnt from this book he was a great international Japanese artist who sought his own originality without forgetting his origin. He also was a very thoughtful person. In future, I would like to see many of his paintings which exists in many countries across the world. I feel proud that I share the same origin with Foujita. This entry was posted in Art, Book. Bookmark the permalink. Very interesting. Your comments made me realize that I don't think I've seen any Japanese man with an earring even today. Sounds like you're busy reading lots of books! Mrs. K. Yeah, I know! Isn't he funky? I haven't decided what to read next though. I have a book called "White Teeth" by Zadie Smith. It's quite long and intellectual, which is why I need to read it again some day to really get it. You're welcome to borrow it if you like! Yes, please Mrs. K, but I'm a bit worried it's quite LONG and INTELLECTUAL. I will have a go!